We have all heard the saying, “New Year, New You.” The new year inspires most of us to start fresh. It’s a time for renewal. Both physically and mentally. Whether it is eating better foods, exercising more or organizing some part of your house or life. The new year is good for all of us. While I am not one for resolutions, but rather goals, this year, my goal is to take better care of myself. This means better food choices and doing some sort of physical exercise, even if it is just power walking. I need a boost of energy in my life. I am an avid believer that you should not have to sacrifice taste when trying to cut calories. Power-Packed Fruit & Nut Energy Bars, made with Jif™ Peanut Powder, are a great way to fuel up before or after exercising, or just when you need a mid-day pick-me-up snack. Let’s talk a second about Jif™ Peanut Powder. Have you tried it yet? It’s one of my new-found loves in life. I love traditional peanut butter but can do without all of the fat. Jif Peanut Powder has the same nourishing protein as traditional peanut butter, but with 85% less fat. Yes! It’s made only from roasted peanuts and has no added sugar or salt like its competitors. Using Jif Peanut Powder is also the perfect way to add delicious peanut taste to smoothies, baking, breakfast and more – with less calories and sugar. That’s where these delicious Power-Packed Fruit & Nut Energy Bars come in. I make a lot of different kinds of granola bars. It is really a cost-effective way to enjoy a delicious snack. These bars are full of power foods including the Jif Peanut Powder, peanuts, chia seeds, flax seed, oatmeal and dried fruits. I also added some protein powder to add an extra burst of energy to these bars. These bars only take two bowls to make. Begin by adding the peanut powder to a medium bowl and mixing it with water according to the package directions. I then mixed in the remaining wet ingredients. I added all the dry ingredients to a larger bowl. Whisk the wet ingredients into the dry. Press the mixture into a foil-lined 8 x 8 pan. These are baked until they are golden brown. Let them cool completely before cutting into bars. I happen to love dried fruit. But, if you are not a fan of dried fruit, that’s ok. Simply swap out the fruit for some chocolate chips. They will be equally as delicious. Since these Power-Packed Fruit & Nut Energy Bars are full of protein, they keep me fueled up and satisfied for hours. By using the Jif™ Peanut Powder, I saved some calories so I can enjoy all of the delicious flavor of these bars, but without the guilt. I was able to purchase the Jif Peanut Powder, along with all the other ingredients for this recipe at Wal Mart. Jif Peanut Powder is located in the same aisle as the peanut butters. How are your New Year goals coming along? Have your powered-up with Jif™ Peanut Powder yet? 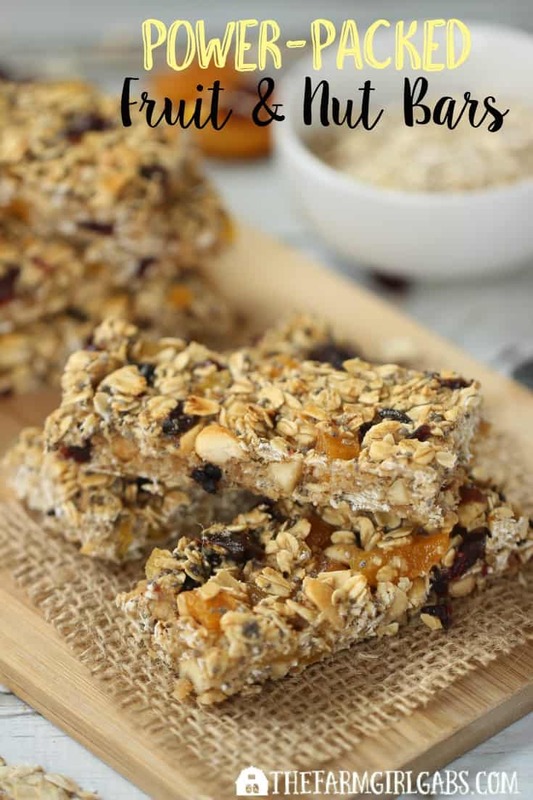 These easy Power-Packed Fruit & Nut Energy Bars are the perfect place to start. Let me know how you like them. 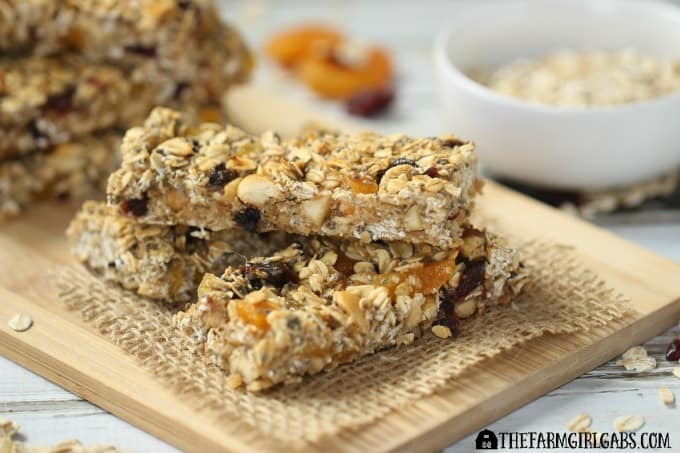 Power-Packed Fruit & Nut Energy Bars are great way to fuel-up in the morning, before or after exercising, or just when you need a mid-day pick me up snack. Line an 8 x 8 baking pan with aluminum foil. Make the ends longer so you can lift out when you are ready to cut bars. Grease or spray foil with non-stick cooking spray. In a medium bowl, combine Jif Peanut Powder (mixed with water) agave and almond milk. Press mixture into the pan. Bake for 18- 20 minutes until golden brown. This is the type of snack I would love in the afternoon. I haven’t seen the Jif peanut powder. I’ll have to look for it. These bars are genius, Melissa. Great and healthy, portable snack that everyone will love. Perfect for lunch boxes! I had no idea that JIF made protein powder. I am already thinking of different recipes using this powder. Your recipe is very clever. I am always looking for power bar recipes to make and carry with me everywhere I go. These bars look fantastic! Our school doesn’t allow any peanut products unfortunately but I love making stuff like this for snacking around the house and family outings… they are filling, healthy and the kids love them! I had no idea they made protein powder. I wonder if it’s available here in Canada? I’m going to have to scope that out. Love these energy bars, nothing better for getting through a long day. So filling and scrumptious. I have only recently discovered peanut butter powder, and I love finding new ways to use it! This is a perfect candidate to try. Thanks! Yum, these look so good – perfect for snack time. I love powdered PB too!